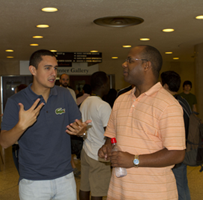 There are four tracks in the Krannert full-time MBA within the marketing specialization or option area: industrial marketing, consumer marketing, marketing research, and consulting. Our objective is to train students for positions in any of the four tracks. Students who complete the marketing specialization in the industrial (or business-to-business) marketing track have the skills to conduct market analysis of customers, competitors, and markets characterized by business to business exchanges. In the same vein, those pursuing the consumer marketing track have such skills for business to end consumer markets. Students who follow the marketing research track are trained to analyze markets using modern research methods for addressing key management decisions. The marketing consulting track is appropriate for those students seeking careers in consulting that have a marketing focus. Many students have combined marketing with Operations, MIS, and Finance. In recent years, Carrier, Otis Elevator, Pratt & Whitney, Disney, Procter and Gamble, IBM Consulting, Ernst & Young, Ford, Intel, Microsoft, Hewlett-Packard, Sears, and Amazon have been some of our biggest recruiters. 10 elective credit hours (5 classes) are required beyond the core course. Four tracks are available, but all 10 elective credits need not come from the same track. Timely and quality information is crucial for the success of firms in today’s highly competitive and evolving environment. Marketing research is an organized way of developing and providing information for managerial decision making. Marketing research is intended for those who expect marketing to be an important part of their professional work. This includes not only those who plan to do marketing research, but those planning to go into other marketing jobs or who expect to be users of marketing research or clients of research departments or research vendors. Thus, this course is aimed at the manager who is the ultimate user of marketing research and who is responsible for determining the scope and direction of research activities conducted on his/her behalf. The quality of marketing research information, its validity and reliability, depend critically on the care exercised in executing the various steps of the marketing research process. Hence, one important objective of the course is to develop a solid understanding of contemporary marketing research methods that are used by better managed firms. The course will provide a basic understanding of research methodology and implementation in marketing. The course will enable you to effectively evaluate marketing research proposals; interpret, review and criticize the subsequent reports; and appraise its usefulness to management. Although one may find this course to be more quantitative in its orientation than an introductory course in marketing, the basic premise is: as a user, one must know enough about a process to be able to ask intelligent questions and seek answers. The process here is research in marketing. Irrespective of your career choice, you will often be required to effectively evaluate marketing research proposals, interpret, review and criticize the subsequent reports, and appraise its usefulness to management. You may also be required to formulate marketing strategies that create greater value for the company. The objective of this course is to equip you with tools required to address fundamental marketing decision problems. We will cover techniques such as: Discriminant and Logit Analysis, Cluster Analysis, Factor Analysis and Conjoint Analysis. These techniques are useful in Market Segmentation, Targeting, Positioning and Product Design. We will also discuss popular marketing decision models like New Product Diffusion Models, Advertising Response Models, Salesforce and Channel Decision Models, and Price and Sales Promotion Decision Models. This course builds on the introductory courses in marketing management. Enables students to formulate a systematic framework for approaching the problem of pricing a product, and more generally, a product line. The concepts and analytical methods necessary to develop such a framework are explored and incorporate marketing, economic, psychological, and organizational factors that influence pricing decisions, as well as competitive and legal aspects. Topics covered include value pricing, dynamic pricing, segmented pricing and price discrimination, bundling and multi-part tariffs, sales promotions, and pricing to the distribution channel. 2 credit hours. This course is designed to provide an understanding of how to manage a brand, product, or product category. The course will be less concerned with the process of collecting and analyzing data, but rather more focused on what do with such data. Even the most skillful marketer cannot make customers buy things that they don’t want. Hence, this course will focus on issues related to customer behavior and customer decision making, with an emphasis on how to utilize such customer-oriented knowledge, especially as it relates to developing ideal forms of advertising and communications, product and/or service adjustments or extensions, and appropriate decisions related to distribution and pricing – all of which must be concerned both with customer acquisition and retention. The course materials will consist of cases, articles, and book chapters covering a number of aspects of brand management and customer behavior. Course assignments will consist of individual case analyses and a larger team project concerning the development of a brand strategy for an existing brand. This course is designed to build on and apply the conceptual tools obtained in the core marketing courses. In addition, the course content is well integrated with other marketing electives, including Marketing Engineering and Research Methods in Marketing (though neither of these is a pre-requisite for Brand Management).